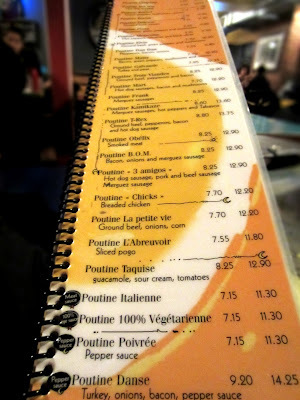 I have friends in Chicago who are obsessed with poutine. Michi makes vegan gravy from scratch (a concession to the vegan husband, though the meat eaters in the group are quite happy to devour it anyway), sources cheese curds from the farmers market, and tends to turn the fries + gravy + cheese curds combination into dinner for two or the perfect thing to feed a gathering of geeks watching the latest episodes of Doctor Who. 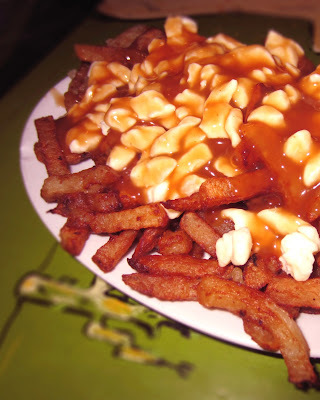 Personally, I've never understood the fascination - in my world, poutine falls somewhere between Kraft mac and cheese (gross) and chili fries (possibly edible once every few years). But when visiting new cities, half the fun is trying regional cuisine. And in Montreal, that means poutine. Talk to any Montrealer about poutine, and they'll probably direct you to La Banquise, which started out as an ice cream shop in 1968. Back then, it was run by fireman Pierre Barsalou, who decided a few months after opening to turn the place into a 24-hour snack bar specializing in hot dogs and fries. Poutine appeared on the menu for the first time in the '80s with two choices: classic or Italian. Today, it's run by his youngest daughter and her partner, and La Banquise features a whopping 25 variations on the traditional cheese curds, gravy, and fries. Montrealers found my friends' obsession with poutine rather amusing - most of them consider it primarily acceptable as late-night grub, the kind of stuff you eat at 3:00am because your options are limited and you've been drinking all night. That's when the craving for grease sets in, and poutine hits the spot. 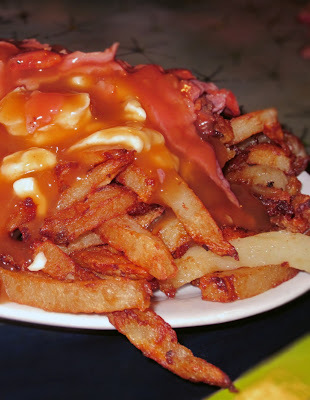 When I visited, we went for broke and ordered a classic poutine and a smoked meat poutine, otherwise known as heart-attack-on-a-plate and double-heart-attack-on-a-plate (yes, I just made that up - but believe me, it fits). I wasn't expecting much, but I was surprised: poutine in Montreal is far better than the examples I've tried elsewhere, and it's actually a decent late-night snack. I understood its appeal for the first time. But I'm with the locals: it's still not something I'd eat for dinner. I just wanted to say thanks again for submitting this to the BT Blog Carnival! LOVE the photos you included. Makes me hungry! Anyway, this article has been included in the 10th BT Blog Carnival which was published today. If you could retweet, stumble, or "Like" this edition of the blog carnival, I would really appreciate it. :) It would also help people discover your article, too!